I signed up for the Athens Half Marathon a few days after returning to the mainland from Hawaii, where I ran the Kauai Half Marathon on Labor Day weekend. Just 200 miles from my home in Charlotte, the quaint college town with respectable media opportunities but without the commotion of Atlanta seemed like the perfect place to notch state number nine. 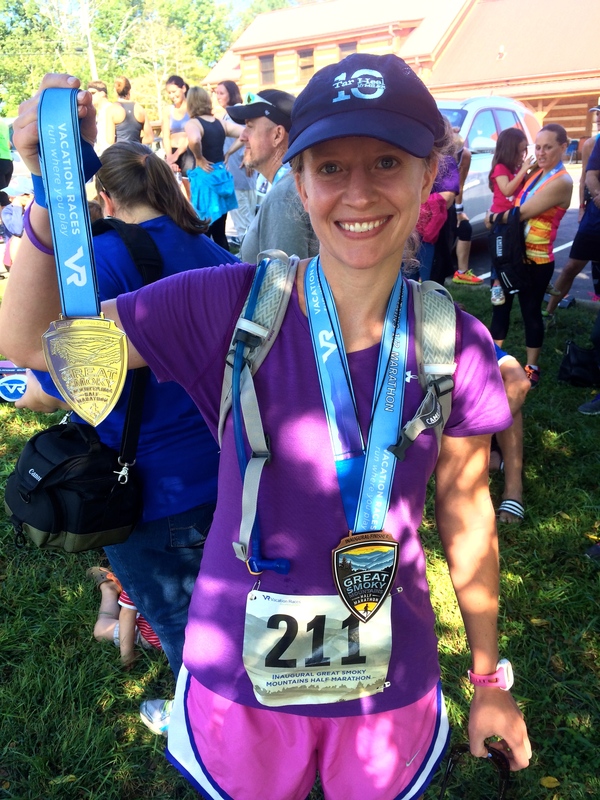 When I crossed the finish line of Charlotte’s Thunder Road Half Marathon blindfolded last fall, I knew the race would be a tough act to follow. But I didn’t intend to stop running for my sister, Taylor, and our fight against Batten disease and other rare diseases. On National Running Day, I shared my plan to run a race in all 50 states – a feat not as rare as running 13.1 miles blind but one that I hope will help me spread our story far and wide. In August, I placed fourth in Oregon’s 13-mile Crater Lake Rim Run. Five weeks ago, I placed second in Tennessee’s Great Smoky Mountains Half Marathon. This morning, I hopped across the border to South Carolina for the Great Pumpkin 5K and state number three. 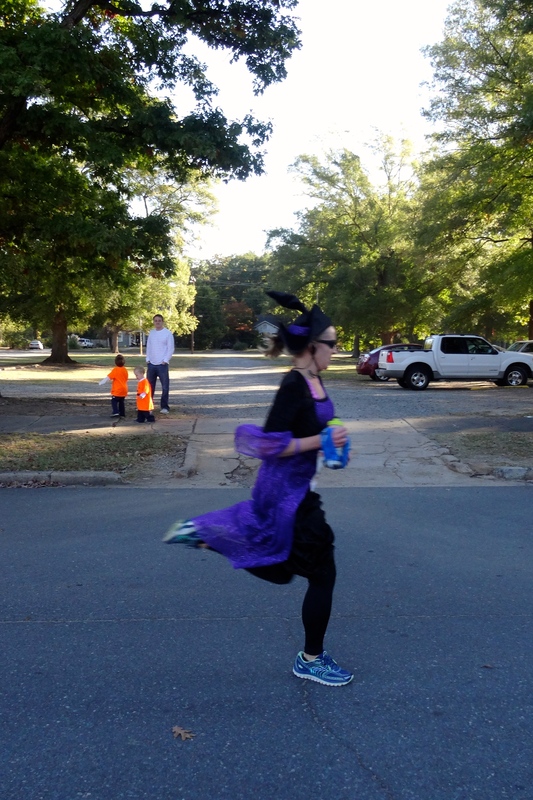 I picked the race because of its proximity to Charlotte; the Great Pumpkin 5K is run mostly on or near the Winthrop University campus in the town of Rock Hill, less than 30 minutes from where all of my family lives in south Charlotte. Taylor’s health is declining, and I haven’t seen her at a race in a long time. As much as I love running, I always try to remember why I run. I picked the Great Pumpkin 5K as my South Carolina race because I wanted Taylor to be the first person I hugged at the end. Usually a stickler for race preparation, I broke almost all of the rules this week. I stayed up late every night and gorged on junk food at an office Halloween party on Friday. I ran very little in the two weeks leading up to the race after suffering a bad ankle sprain hiking in Utah earlier this month. It was still sore when I went for a quick jog this week, but I just gritted my teeth and watched out for potholes. I have a closetful of performance running apparel. But two hours before the race, I pulled on a long dress made of fake crushed velvet and purple sequined lace and a floppy, matching hat. The stuff wasn’t made to wick sweat. But it was Taylor’s Halloween costume three years ago – the last time she went trick-or-treating. That made it magical. I got out to a quick start. I slowed a bit midway through the race as my ankle began to throb. But I got a boost from the spectators sprinkled along the course as they shouted encouragement. Running a 5K in full costume is an effective way to attract attention. I wish I’d had a handful of Taylor’s Tale wristbands to launch at them; alas, the purple witch costume doesn’t have pockets, but I can yell “Visit taylorstale.org!” like my life depends on it. With about half a mile to go, I knew I was near the front of the pack. I found another female runner to “draft.” I settled into a comfortable pace and waited till the final turn to pass her and accelerate into a full-on sprint. 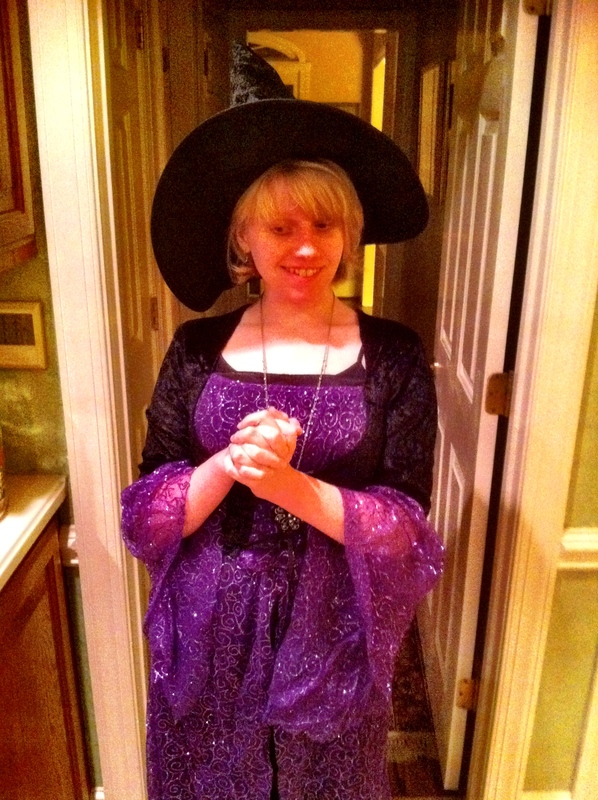 Don’t knock the purple witch dress; it’s more aerodynamic than you’d think. I crossed the finish line 12th overall and first in my division. I got a big hug from my husband, John, and my dad. Later I got a hug from the runner I’d passed in the last half-mile, a woman named Dianne in the masters division. She ran Thunder Road last year, and she knew our story. I gave her the wristband on my arm as we waited for our age group awards and the morning sun warmed our skin, and silently I reaffirmed the importance of these runs for the thousandth time. But I never got to hug my sister at the finish. Nothing about Batten disease is easy. But 2014 has been an especially rough year for Taylor. This year, my sister stopped talking. She ran two 5Ks blind, but now she’s in a wheelchair. She got a feeding tube in June. She’s been to the emergency room multiple times. Batten disease is a monster. And Batten disease is winning the battle for my sister. All week we’d hoped Taylor would be able to come to the race, because that would mean she was having a “good” week. But yesterday was a really bad day. Yesterday marked another milestone for Taylor, and in my sister’s world, milestones aren’t a good thing. Milestones represent another rabbit hole; another point-of-no-return. I hate Batten disease so much. I hate what it’s doing to my sister and the people I love. I hate that the Halloween Taylor wore the purple witch dress feels like a million years ago, because figuratively speaking, it was. But I’ve got more races to run and stories to tell, and Taylor’s Tale has great work left to do. While I don’t know what the future holds, I know Taylor and I have tomorrow. And tomorrow is always something worth fighting for. Make a tax-deductible gift today and help write the happy ending to Taylor’s Tale. I kicked off my quest at Oregon’s Crater Lake Rim Run on August 9; on Friday, I drove to Tennessee’s Great Smoky Mountains National Park for race number two. John and I stayed in Townsend, the host town for the inaugural Great Smoky Mountains Half Marathon. Known as the “peaceful side of the Smokies,” Townsend sits at 1,070 feet, an average of 6,000 feet lower than my August race. Crater Lake is one of the most gorgeous places I’ve ever been, but Townsend’s smoky blue hills are more like the mountains I grew up climbing, and my Achilles tendinopathy and calf tightness gave me a lot of trouble in the week leading up to the race, so I was thankful for East Coast elevation and the “gradual hills” promised in the race guide. Taylor has never been to Tennessee, but the Smokies are a subrange of the Appalachian Mountains, and North Carolina’s Appalachian Mountains have always been one of our favorite places to spend time together. John and I were married in a charming mountain town called Blowing Rock; my sister loved to play on the town park’s swings in the summer and drink hot chocolate at Kojay’s Cafe in the snowy winters. It’s close to impossible for my sister to travel these days (I’d hoped my mom and Taylor could go to the race in the Smokies with me, but it didn’t work out), but the Appalachian Mountains hold a lot of happy memories for my family. You might remember that for the Oregon race, I wore a string of beads Taylor made for me while she recovered from surgery at Oregon Health & Science University. For the Great Smoky Mountains Half Marathon, I packed a purple heart necklace my parents bought for Taylor at Blowing Rock’s Cone Manor. On race morning, I awoke early to prepare. You may know that I’m ultra-competitive, but for this race, I’d made a pact with John that I would focus on finishing the race without injuring myself further, sharing Taylor’s story and getting home safely. While John slept in the dim hotel room, I used a foam roller and pleaded with my calves to loosen, and I said a silent prayer over my Achilles. I flipped on a small light and wrote my signature “4TAYLOR” on my arm in purple ink (I won’t let anyone else do it). I filled my purple Camelbak with water and laced my just-broken-in purple Brooks Glycerin shoes. Everything, even down to my Garmin watch, was purple or pink (Taylor’s favorite colors). After I pinned on my bib, I slipped my sister’s necklace over my head. I felt tight through the playing of the national anthem, the sound of the starting gun and the race’s first turn. But as the course opened up, I saw the sunrise flooding the sky behind the mountains, an open field stretching out like a blanket beneath it. It looked like heaven. I felt my sister’s heart against my heart. And suddenly, my legs didn’t hurt anymore. I found my stride, and I kept it. John came to the last bridge at mile eight, and it’s a good thing he did. His support gave me the emotional boost I couldn’t get from my CLIF Shot Bloks, and the next three miles were the toughest of the race. In addition to a steep climb, they were on curvy, severely banked mountain roads that reminded me of the ones I ran at Crater Lake. I felt a huge blood blister forming on my right foot as my right side took a constant pounding. I thought about my left Achilles and thanked God the road wasn’t banked the other way. At mile nine, I couldn’t help it: I speed-walked two of the hills. A year ago, I wouldn’t have dared walk in a race. But I’ve gotten older and wiser (and more injured); I’ve learned that this 50-state quest is a marathon, not a sprint, just like Taylor’s fight against Batten disease and our fight for a better future for the millions suffering from a rare disease. If we give too much too quickly, we won’t have any gas left in the tank for the next mile; we won’t survive to see the finish line. Eventually, the finish line of the inaugural Great Smoky Mountains Half Marathon came into view. I didn’t sprint for fear of popping my injured Achilles, but I gave it a little extra and ran across the finish line like I hadn’t just run 13.1 miles. Injuries, speed-walking and all, I finished with my second-best half marathon time ever (but still seven minutes off my PR). I told John there was no way I’d won an award. My age group (30-34) is usually the toughest, and at this race, it had the most runners by a long shot, with 107. But it was a gorgeous morning, there was a bluegrass band playing, and our hotel had granted us an extended checkout. So we decided to stick around just for the heck of it. The race gave awards five-deep. Once they’d given out medals for fifth, fourth and third place in my division, I started to walk away. That’s when they called my name for second place. John let out a loud whoop, but I was still in a daze as I walked up to get my silver medal. A lot of people would have taken the rest of the day off, but that’s not my style, maybe partly because Batten disease has shown me how short life can be and how precious each day really is. In any case, after a quick shower and an unhealthy lunch (cheeseburger, French fries, root beer float and chocolate truffles), John and I loaded our packs, drove to another area of the park and hiked one of its steepest trails. After we scrambled up the bare stone face of Chimney Tops like a couple of mountain goats, I pulled out my medals and race bib for one last photo. I knew that when I got back home, I’d return to two distinct battles against Batten disease. In one of those battles, Taylor’s Tale and other advocates are gaining ground every day. I believe that with all of my heart. In the battle that hits closest to home for my family and me, we’re losing — and no medal I win can change that. But for that moment in time, I was on top of the world.